Hans Christian Andersen was born in Odense, a town named for its river and the third largest city in Denmark on the island of Funen between Jutland and Zealand. The town boasts about its great children’s author and has tours of the yellow-painted, wooden, one-room house the Andersens called home until his father died when he was 11. Although it may sound idyllic, his childhood was anything but. His father was a failed shoemaker who took appointments and was inconsolable when his shoes didn’t find a commission at the squire’s estate. Destitute and out of work, Han’s father read the newspapers about the great Napoleon and saw his only way out. He received a fee of 1,000 thalers (silver coins) to go to war to fight in place of a rich farmer’s son. When his father returned from combat two years later, he had post-traumatic stress. He battled ghosts and the devil. His father’s father was quite mad—he may have had dementia—and his father’s mother told lies. Hans learned delusion from the hospital where the sick, the elderly and the mad made home and where his grandmother tended the garden. She did teach him to take harsh words and turn them into compliments though, and he would use that endowment throughout his life. Hans knew he was not a pretty boy. His limbs were long, as was every other appendage on his person. His long, homely face had hooded eyes but it was his long nose that peered down from his broad forehead that made him complete with astonishing lengths. He did have a penchant for creating his own little lies; he called them fantasies. He spoke and sang with notes that made swans tread water to be near him. He also spent a lot of time in that one-room house daydreaming and making puppets and dolls. His mother became a washwoman taking other people’s clothing to the river, a very difficult job, but she did teach him folklore and superstitions when he accompanied her, which was just about the best gift she could give him. When he was seven, his parents had taken him to see a play at the local theater. Once he heard the rustle of big costumes, saw the bright lights and witnessed the cheekiness of the characters (it may have been the vaudeville of Ludvig Holberg), his world expanded as if a champagne cork let go. He began to write stories and plays, pestering his neighbors to listen to them ad nauseaum. An apron became a cloak—anything could be a prop—but still many thought he was going mad like his grandfather. At 13, he sneaked into the Odense Theater backstage and told all the actors of his love for acting. He was certain he would be known throughout all Denmark. He was given a tiny part in an operetta Cendrillon. He stated to his mother, “First you go through terrible suffering, and then you become famous." Now his life was all about pleasing people and earning their approval. At 14, it was customary for boys to learn a trade. His mother had an apprenticeship with a bookbinder or a tailor in mind for him, but he wept at the thought. His soul was burning for the art of acting. His mother gave a mail-coach driver six shillings to drive her son to big city of Copenhagen, where he would seek his fortune with just a small bundle of clothes. At 14 years old, he had saved up 13 rigsdaler (Danish currency). A wise crone in the poorhouse foretold his success after reading her coffee grounds. Violence directed at Jews—evidence of Denmark’s’ last pogrom—met Hans in Copenhagen, but he steadfastly persevered. He managed to wrangle his way into the Royal Theater’s singing school, but when the high notes of his aging soprano failed him, he took bit parts until a philanthropist arranged a scholarship for him to attend Latin school and to receive the education he never had. He was now 17 while his classmates were 11 and 12. Hans Christian Andersen was bullied for his protruding prodigious nose, his tusk-like teeth and gangly limbs. Even the headmaster tormented him. As an outlet, he took to his poems and at 22, published one in a Danish paper. This was all the encouragement he needed. Unfortunately, his mother died in the Odense poorhouse in 1833, never to learn of her son’s meteoric rise to fame. No longer unknown, he traveled the world, dined with kings and was friends with the Brothers Grimm and Charles Dickens. His books were made into movies, ballets, television shows, ice revues and stage musicals. He is still considered a genius today. Yolen, Jane. 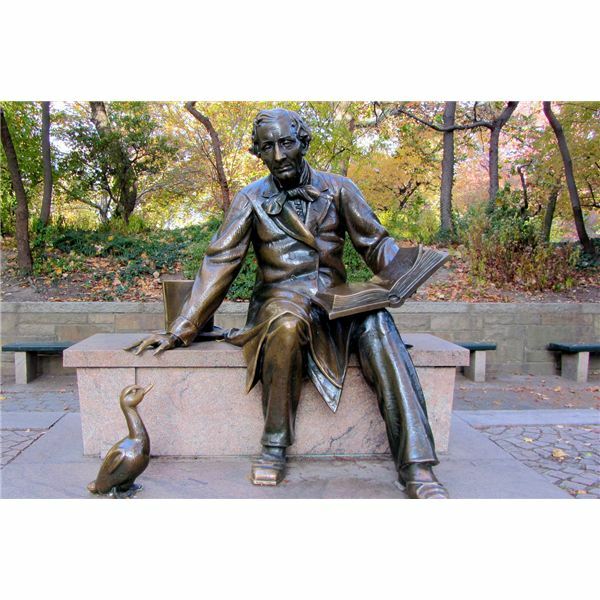 Hans Christian Andersen: The Perfect Wizard. New York: Dutton Children’s Books, 2004. Book. Hesse, Karen. The Young Hans Christian Andersen. New York: Scholastic Press, 2005. Book.